I love this product, time saver ! I don't have to write the return address, this product is a time saver. Love it. Walter Drake is my go to company for mailing return labels. They are high quality and easy to use. I do alot of craft work out of my home so I sending things though the mail alot...Now I have the labels to put on everything I send and it saves me alot of time. I really love all the different rainbow colors. Awesome product! Extremely prompt and accurate service. 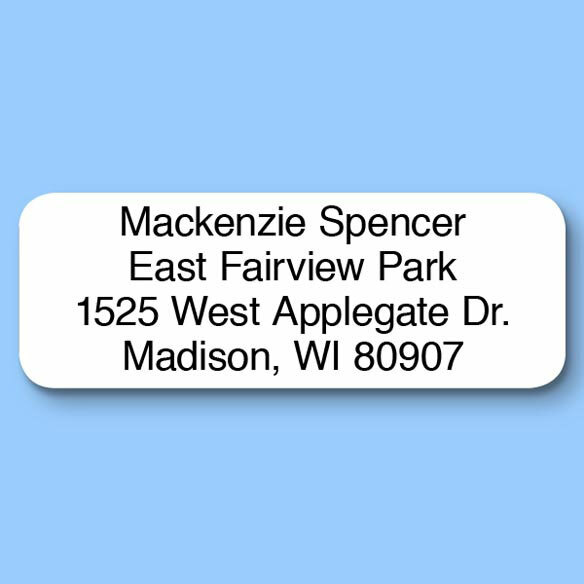 THESE ADDRESS LABELS ARE AWESOME!! Easy to use, attractive and inexpensive!! it comes in a samll little box that is easily stored away.great colors.and very easy to use. I wanted an address label that included both my name and my husband's name. This is perfect. The white color is the best! Have purchased this before and will do it again. These labels are great and this is 2nd time I have ordered them for our local citizens assoc. I will continue to buy them as they are easy to use, read and secure on envelope. I use a set; my wife uses a personal set; we both use a Mr. & Mrs. set. Excellent product. I am of the older generation and still send snail mail and cards and letters to friends and family. These labels look good and are easy to use. What I love best is the box takes up little room and fits perfectly in my desk drawer. Have used these for years - on envelopes and forms. Easy to keep on hand and use. Not happy that there are only two address labels per sheet. Other than that I like them. I ordered this very same item about two years ago & loved them. When I reordered them the print size was smaller & the ink printing was very light. I really liked the larger (thus easier to read) of the past. After browsing multiple sites, this was the best value for the money.